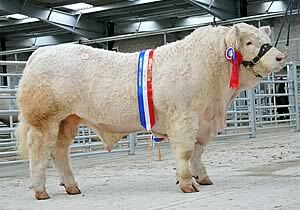 Sale leader at 8,300gns was the 17 month old Pedr Dougal who earlier in the day had been awarded the supreme championship for Peter Howells, Llanwenog, Llanybyther who was continuing to keep the silverware in the family; his father, John had secured the Welshpool Charolais title on two previous occasions. “Dougal was a tremendous young bull that stood out from the rest; he had shape and length and will grow on to be an excellent crossing sire,” said judge, John Williams, Caersws. Sired by the 16,000gns Blelack Tycoon, who has so far produced a string of 12 sons to average 8,000gns, Dougal was out of a homebred dam from the Howell’s 50 cow herd who goes back to Gwenog Ivory, dam of the 31,000gns Pedr Thumper. He went to join Wyn Ashton’s 200 cow suckler herd at Cefn Coch, Welshpool. “We’ve used Charolais over the herd for 20 years because the breed leaves calves that gain that the extra weight, they’ve got good temperament and invariably find themselves among the day’s top prices at Welshpool sales,” he said. Next at 7,500gns was Dorcas Danzig, an 18 month old first prize winner from George and Claire Morris. A Blelack Topgun son, he was out of a Maerdy Ozone sired dam from their 260 cow pedigree herd based at Easington, Aylesbury. Danzig was knocked down sold to DT Richards, Llangynwyd, Maesteg. Father and son team, Bob and Rhion Roberts, Abergele sold their best at 5,800gns to RJ Roberts, Llanegryn, Tywyn. The 18 month old Brynffanigl Duke was by the 17,000gns Alsnow Almighty and out of a homebred dam from their 35 cow herd by Doonally New. The same breeders offered another Almighty son, the April 2008 born Brynfannigl Duranduran at 3,600gns to GC Morgan, Mochdre, Newtown. David and Louise Barker, Nuthampstead, Royston made a highly successful 360 mile round trip to Welshpool. A 5,400gns call was made by RE Griffiths, Criccieth for their Caylers Defender, an 18 month old by the 6,500gns Maerdy Uniroyal and out of a homebred cow by Killadeas Lloyd. Their second entry, Caylers Dollar stood first in his class and sold for 5,200gns to SD Powell, Llanyre, Llandrindod Wells. A Doonally New son he was out of a homebred cow by Killadeas Prunty. A bid of 5,000gns secured the 20 month old Midas Dandy for DA Jones, Llanidloes. Bred and exhibited by Roger Coppinger and his son, Drew, Edstaton, Wem, Dandy was by the 2006 Royal Welsh junior male champion, Gower Armarni and out of a Falleninch dam by Mortimers Tebay, a son of the celebrated Burke trophy winner, Mowbraypark Gigi. Midas Drew, an April 2008 born entry from the Coppingers made 4,000gns to HP Thomas, Sennybridge, Brecon. A Burradon Talisman son, he was out of a Burnaston bred cow. Gareth Roberts enjoyed his best ever day at Welshpool which began when his rising two year old, Montgomery Druid was awarded the day’s reserve champion and later sold for 4,600gns to WT Jones, Abergynolwyn, Tywyn. Druid was the first of a crop of calves to come under the hammer sold by Tullygarley Attaboy and out of a Shrawardine sired homebred dam from his Llangadfan based herd which has recently been reduced to 40 cows and introduced to a new breed improvement strategy. Shortly afterwards, Mr Roberts offered two more Tullygarley Attaboy sons; Montgomery Dewi, a 20 month old out of a Maerdy Ossie sired cow sold for 4,800gns to R Reynolds, Beguildy, Knighton, while the May 2008 born Montgomery Delta commanded a second 4,600 bid, this time from WJ Lewis, Pennant, Llanon. Gareth Jones, Cwmtirmynach, Bala sold his best at 4,800gns to ET Bound, Llangurig, Llanidloes. The 19 month old Esgob Dewi was by the 18,000gns Thrunton Virginian and out of a Roundhill Rocky sired homebred cow. Two, 19 month old Nectargerc sons were in the money for Mold based vet, Esmor Evans. Maerdy Draper commanded a 4,500gns bid from Messrs Herring, St Davids, Brecon, while Maerdy Dayzona sold for 4,000gns to JL Davies, Mythyr Cynog, Brecon. Maerdy Diver, a 14 month old youngster by Maerdy Padirac from the same breeder was matched by another 4,000gns bid, this time from AJT Powell, Llanyre, Llandrindod Wells. At 4,500gns, the Pennie family, Glyn, Chris and Nigel, Llandysill, Montgomery offered Sarkley Dakota, a 19 month old by Doonally New and out of a homebred cow by De Crespigny Dunkirk. He went home with L and S Phillips, Llangarron, Ross on Wye. The female trade was led at 2,700gns by Ribbledon Taboo, a seven year old by Ribbledon Porterhouse and out of a Brampton Tenpin sired dam from ML Impey and M Davis, Ludlow. She was sold with her five month old bull calf, Congress Enrico by Balthayock Champion to the Sellick family, Williton, Taunton. Averages: 50 bulls £3,349.50; one cow and calf £2,835.00; six heifers £1,960.00.